Owen Garriott, a Skylab and space shuttle astronaut who was the first to use amateur radio from orbit, has died at the age of 88. 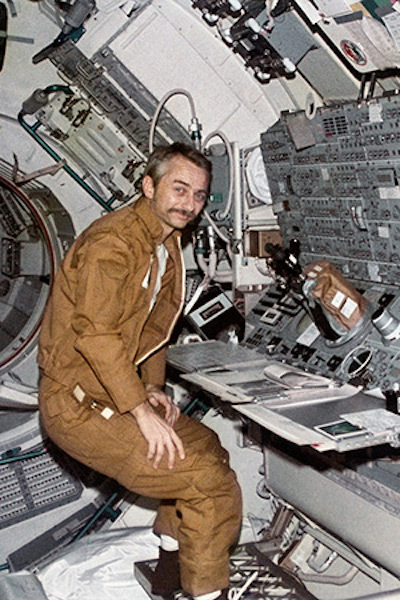 Garriott's death on Monday (April 15) was reported by the Association of Space Explorers (ASE), an organization of international astronauts and cosmonauts that included Garriott as a distinguished member. "We've just received word from the family who asked us to pass along the sad news that Skylab and shuttle astronaut Owen Garriott has passed away at his home in Huntsville [Alabama]," the ASE posted to Twitter on Monday. "He will be sorely missed." NASA also recognized Garriott's death in a statement released Monday afternoon. "The astronauts, scientists and engineers at Johnson Space Center are saddened by the loss of Owen Garriott," said chief astronaut Patrick Forrester. "We remember the history he made during the Skylab and space shuttle programs that helped shape the space program we have today. Not only was he a bright scientist and astronaut, he and his crewmates set the stage for international cooperation in human spaceflight." A member of NASA's first group of scientist-astronauts selected in 1965, Garriott flew twice into space, logging a total of 69 days, 18 hours and 56 minutes off the planet. Garriott launched on his first spaceflight as the science pilot on the second crewed mission to Skylab, the United States' first space station. He and his two crewmates, Alan Bean and Jack Lousma, lifted off on July 28, 1973 atop a Saturn IB rocket and spent a then-record setting 59 days on board the orbital workshop conducting science experiments. "We could see the Sun in ways that simply were not possible before, for long periods, [at] ultraviolet and X-ray wavelengths, and look at the corona, look at the mass ejections throwing material far out into the corona," said Garriott, referring to his and his crewmates' solar observations, in a 2000 NASA oral history. "Some of that [data] is actually still being used for research purposes today for comparisons with some of the more modern satellites, which can do things even better than we did." 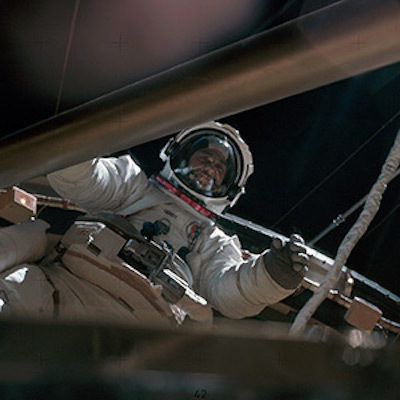 Garriott and his Skylab 3 (or Skylab II, depending on the chosen nomenclature) crewmates were also the subjects of physiological studies and biomedical monitoring to learn how the human body reacts to long durations in microgravity. "We learned the importance of exercise," explained Garriott. "If you have the appropriate amount of exercise, namely one to two hours a day, then you're going to come back in essentially as good a condition as when you left." 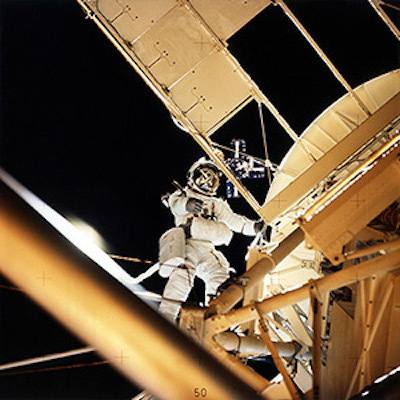 Garriott also performed three spacewalks — two with Lousma and one with Bean — spending nearly 14 hours outside of Skylab to swap out film cartridges, retrieve experiments and, on his first extravehicular activity (EVA), to deploy a large solar shield to help compensate for damage that the space station had sustained during its launch. "The twin poles sunshade was important to bring the temperatures down to a more permanent 70, 75, 80-degree [Fahrenheit, or 21 to 26 degree Celsius] level," he described. In addition, Garriott had the unexpected opportunity to test fly a prototype jetpack inside of Skylab. Only Bean and Lousma were trained for the Automatically Stabilized Maneuvering Unit (ASMU), a predecessor to the Manned Maneuvering Unit (MMU) later used on the space shuttle, but following the planned tests being completed, Garriott was given the chance to try it as a novice. "I remember Alan saying, 'Okay, Owen, you're on your way,' [and he] just turned it loose," recalled Garriott. "It [was] surprisingly intuitive. With just a modest amount of training in how to fly a spacecraft with a translation and attitude control thruster, you could fly around ... making turns all the way around." Garriott, Bean and Lousma splashed down aboard their Apollo command module on Sept. 25, 1973. Garriott returned to space a decade later, launching on Nov. 28, 1983, on board the space shuttle Columbia as a mission specialist on the STS-9 crew. The 10-day flight marked the first use of the European Spacelab laboratory module. "The whole mission was oriented towards making clear that the Spacelab, the laboratory that fit in the payload bay of the shuttle, was useful for the whole range of scientific disciplines," Garriott told NASA. "So not only a lot of biomedical work, but also astronomy, fluid physics, materials processing, atmospheric sciences, all were represented with differing experiments." Between his mission tasks, Garriott also had time to set another first, drawing on a license he obtained when he was a teenager. "It was my good fortune to take the first amateur radio into space," said Garriott. "In my spare time only, I managed to hold up an antenna to the window and to talk to amateurs on Earth." About 250 ham radio operators were able to connect with "W5LFL" — Garriott's call sign — becoming the first people to talk with an astronaut in orbit without the conversation being routed through NASA's flight control loops. "When in orbit over land, I could make a CQ, which is a general call, and see who responded," Garriott said. "Among others, I was able to speak with the amateur radio club in my hometown of Enid, Oklahoma, with my mom, with Senator [Barry] Goldwater, and with King Hussein [of Jordan], who was an avid ham." Owen Kay Garriott was born in Enid on Nov. 22, 1930. He received his Bachelor of Science in electrical engineering from the University of Oklahoma in 1953 and a Master of Science and Doctorate in electrical engineering from Stanford University in 1957 and 1960. From 1953 to 1956, Garriott served as an electronics officer while on active duty with the U.S. Navy. He then taught electronics, electromagnetic theory and ionospheric physics as an associate professor at Stanford until he was selected by NASA for its fourth group of astronauts. Prior to flying on Skylab 3, Garriott served as a capsule communicator, or capcom, in Mission Control for the Apollo 11 first moon landing mission in July 1969. "I was on the capcom's position while they [Neil Armstrong and Buzz Aldrin] were all sleeping for the first night on the moon. So, not a lot of work on that one, but you have to be ready, of course," said Garriott. "You have to be prepared to handle almost any emergency that might come along. So you learned a lot in that role." "I hope I was of value to the Apollo 11 team in the conduct of the flight. I'm sure it was of value to me in preparation for the Skylab program," he said. After his space shuttle mission, Garriott served as a program scientist in NASA's space station project office, working with the scientific communities and advising the program's management on the early design of a new space station. Garriott left NASA in 1986 in the wake of the space shuttle Challenger tragedy, when it became clear to him that he would not have another opportunity to fly into space. "If I'd have had a chance to fly in late '86 or '87, then I wanted to stay for another opportunity. But when that was clearly going to be delayed five years, I just decided that from a personal perspective it'd be better to leave that to somebody else," he said. 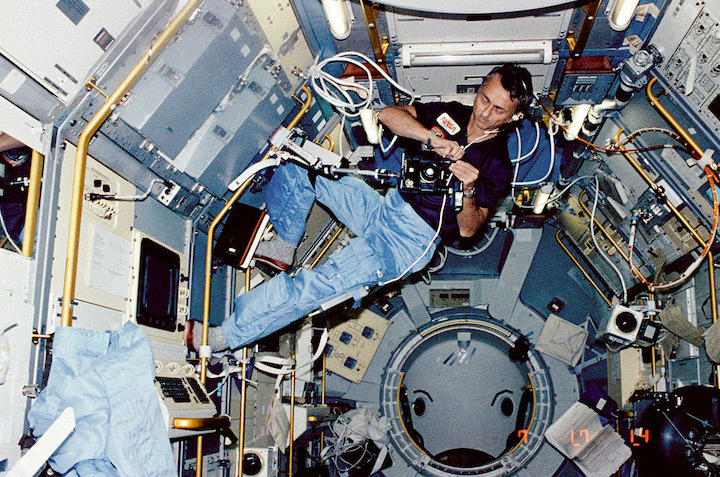 From 1988 to 1993, Garriott served as the vice president of space programs at Teledyne Brown Engineering, which supported payload integration for the Spacelab missions and had a role in developing the U.S. lab for the International Space Station. In 1995, Garriott and his first wife founded Leonardo's Discovery Warehouse, a children's edutainment center in Enid. Later, Garriott joined the Laboratory for Structural Biology at the University of Alabama in Huntsville, where he participated in research involving microbes that he returned from extreme environments such as deep sea hydrothermal vents. Twenty-five years after his second and last spaceflight, Garriott supported another history-making mission — this time by his son, Richard. The elder Garriott helped design and organize the commercial science experiments that accompanied his son on an October 2008 self-funded flight to the International Space Station. The two were also able to connect via ham radio. For his service to the space program, Owen Garriott was awarded the NASA Distinguished Service Medal, the Robert J. Collier Trophy and Robert H. Goddard Memorial Trophy (the latter two shared with his fellow Skylab crew members), among numerous other honors. He was inducted into the Oklahoma Aviation and Space Hall of Fame in 1980 and the U.S. Astronaut Hall of Fame in 1997. Garriott wrote about the first U.S. space station with co-authors Joe Kerwin and David Hitt in "Homesteading Space: The Skylab Story," published in 2008 by the University of Nebraska Press. Garriott was preceded in death by his first wife, Helen Mary Walker, with whom he had four children, Randall, Robert, Richard and Linda. He is survived by his wife, Eve Long Garriott.